today’s ‘wifestyle profile’ features the hilarious and brilliant rachel, who is currently living in china! she shares about cultural difference between her and her husband, appreciating weirdness and even how to respond when your husband buys a huge bear costume online. check out her blog, leave her some comment love and just try not to completely crack up at her last photo (hint: it’s impossible)! My name is Rachel and I blog at The Random Writings. The timing of this guest post is rather perfect, as my husband and I are celebrating our 4th wedding anniversary tomorrow. Normally, I blog about such interesting things as figuring out how to say chicken breast in Mandarin Chinese, but this week there will probably by a little extra lovey-doveyness on the blog than usual. We have a unique anniversary photo tradition that we have fun with every year, I’ll be posting the pictures on the 4th! Like so many couples out there, my husband and I met and became friends in college. 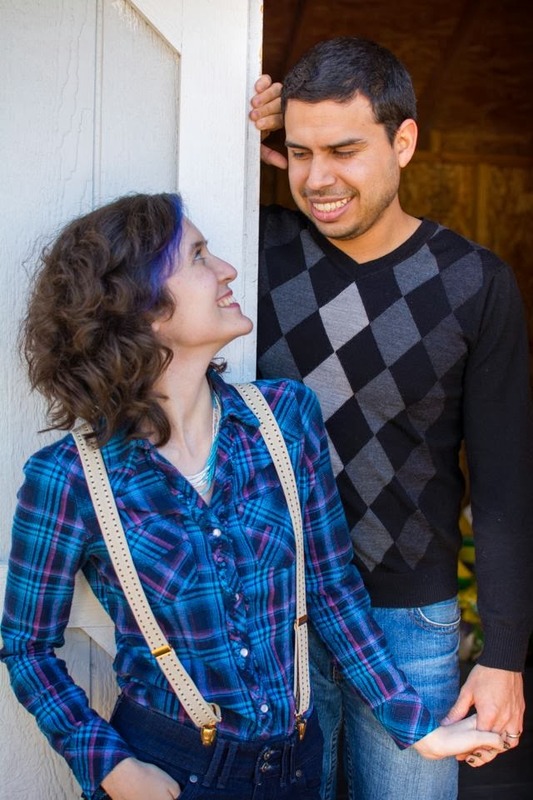 It was your very average 24 year old super-senior 2nd gen Mexican-American meets and decides to marry 17 year old freshman white girl who grew up in SE Asia love story. We didn’t get married till I was 19, though, which is very legal. What I love about marriage is that as the years go by, we can simply learn how to be better and better partners by working in our own areas of skill and helping out our spouses in their weak spots. Angel has done an excellent job of recognizing and supporting my abilities and goals throughout our marriage. One of the conditions of us getting married when we did (during my junior year of college) was that I would finish getting my degree. I did that, and already had my B.A. in Mandarin and 1.5 years of marriage under my belt before I turned 21. My passion is for writing, and though we both work as teachers right now, in some earlier seasons of our marriage, Angel worked as a hospital nurse and gave me freedom to not have a “normal” 9-5 job, in order give me more time to pursue my dream of writing. I absolutely love my job as a teacher, but I also thrive on flexible schedules, and when I wasn’t working a “normal” job, that fact paired with Angel’s unusual hospital shifts gave us all the flexibility we needed to take off on little roadtrips around the Midwest and beyond together. Neither one of us are the type who like being tied down, so we both flourished working around his schedule of three 12 hour shifts per week. Angel can be incredibly forgetful. I, on the other hand, remember everything. When we hop in the car I’ll randomly say something like, “We’re going to the grocery store” so that he doesn’t end up driving towards his place of work. When we were first married I felt like reminding my husband about stuff he needed to remember all the time sounded like nagging, and I didn’t want to be a nag, but I’ve since learned that he appreciates my reminders about schedules and commitments…and it’s a well-known truth that he locked his keys in his car on a regular basis till I came around. Between any two people, there are cultural differences, but when you marry someone who grew up in a different country and speaking a different language than you, those differences are a little larger than normal. Not every aspect of Angel’s culture comes to me naturally (I’m probably never going to be the type who automatically greets relatives with a kiss, but when I know it’s expected, I can do it). Instead of feeling left out when my husband’s family speaks Spanish with each other, I can choose to learn and listen and keep up with the conversations to the best of my ability, and I can eat new foods–chances are I’ll enjoy some of them, and some of them I won’t, but there is no reason to write something off without giving it a good try (except cow tongue. Anyway, Angel loves cow tongue so much that he’ll eat my serving for me so there’s really no problem there). We currently live in China. This was not a case of one of us having the idea and talking the other into it. I have had the dream to move to Asia for several years already, but I knew it wasn’t the kind of think one ought to coerce a husband into doing. In my mind, it was only the right thing for us if Angel of his own accord told me that he wanted to move to Asia. In August 2013, Angel emailed me (we were in different countries at the time) to say that he thought we ought to move. I responded with, “Let’s go!” and here we find ourselves, nearly a year and a half later, making our home in SE China. I’m glad that I waited, that I didn’t try to persuade my husband to move immediately when I wanted to, because the thrill of being here when we both love it is amazing. I’m a bit of an oddball, an outsider. I’m just being honest. Homeschooled kids who start attending college before they can even drive and who wear all the colors of the rainbow at the same time and go off into long conversational tangents about the linguistic origins of Chinese characters are rarely considered normal. You can choose to get mad when you spouse buys a mascot-style teddy bear costume online, or you can choose to laugh and make it into a blog series, it’s all perspective. My little sister said once that she thinks that the reason Angel and I make a perfect couple is that neither one of us are normal, but somehow we understand and anticipate each other’s abnormalities. 1. In what way do you choose to appreciate your spouse’s quirks instead of be exasperated by them? 2. What cultural differences have your and your spouse come across in your marriage? 3. Do you think it is a good idea to buy a teddy bear costume on eBay? My husband is an artist and I’ve always loved that about him so all of his quirkiness is appreciated. Except the farting to music. That I can live without. Our biggest differences were that he grew up Catholic and I grew up Protestant but neither of us practiced so the difference wasn’t very pronounced. He has recently discovered that he is Metis (aboriginal and French descent) so he is really into discovering his Metis heritage right now. I once bought an acre of land on the moon (on purpose- it wasn’t a ‘hey I’ve got a bridge in Florida to sell you’ type of thing) so bring on the teddies!